Join Fort Calgary in the Burnswest Theatre for a night at the movies! 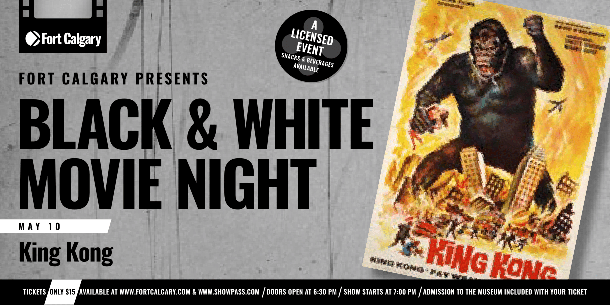 Grab snacks and a cocktail at this licensed event, and enjoy a classic black and white movie in Fort Calgary’s newly renovated theatre. Doors open at 6:15 PM, so come early to reserve your seat and take a look at Fort Calgary’s Interpretive Centre. The movie will start at 7:00 PM. King Kong is a 1933 American monster adventure film directed and produced by Merian C. Cooper and Ernest B. Schoedsack, and stars Fay Wray, Bruce Cabot and Robert Armstrong. The film tells the story of a film crew that visits a tropical island for an exotic location shoot and discovers a colossal ape who takes a shine to their female blonde star (Wray). He is then captured and brought back to New York City for public exhibition.